WAMU’s Series on Problems with Some Flipped Houses | Park View, D.C.
« Are You Familiar with the Bitter Dose Combo? 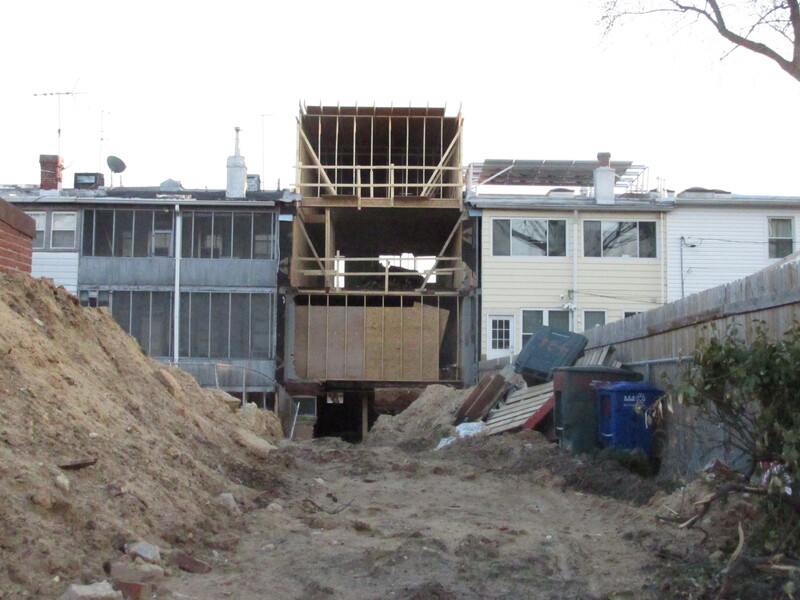 Rear of house under construction on Quincy Street, NW. Yesterday, WAMU aired the first part of a three part series by Martin Austermuhle titled “Flipped Off: In D.C.’s Thriving Market For Renovated Homes, It’s Buyer Beware.” The series continues today and tomorrow you can read the articles or listen to them at the WAMU Web site. The first part focuses on the experience of one homeowner who bought a deeply flawed flipped house. The second part focuses on one flipper who is currently the focus of investigators, and the third part appears to focus on regulation enforcement and DCRA. As good as this series is in highlighting some of the bad development that our neighborhoods are currently encountering, it is a very small sample of the inferior flipping and popping-up that can be found in many parts of Washington. Aesthetic issues aside, my greatest concern with much of the construction occurring these days is how much is accomplished without permits and the impact this has on safety. Back in March I posted about two row houses in the area that received Stop Work Orders because they were constructing pop-ups without the proper permits. Hopefully, the WAMU series will trigger a larger investigation within the development community to separate the bad developers from those doing quality construction. This entry was posted on May 6, 2015 at 7:01 am and is filed under Construction, Development. You can subscribe via RSS 2.0 feed to this post's comments. You can comment below, or link to this permanent URL from your own site. I’m always curious about the homes whose interiors are completely gutted, then rebuilt, then sold. There are one or two houses on the 3200 block of Warder Street that are gutted inside (I can see from the back alley), that essentially become shells and will be rebuilt. I’m sure it’s expensive but worth it, esp if you’re refitting the shell with fancy fixtures and detailing/room layout with modern tastes in mind. largely within the United states and You.K. Chromebook for instant text messaging connection (no voice and video nevertheless, all those call for a connect-in installing).